The weather was beautiful here today. The temp was in the low 80s but as the sunlight waned, the mercury dropped into the 70s. It hasn't been this cool during the day since April. I was on the road early this morning for a gig on the local community access channel in Northwest Alabama. We have a workshop next week, and this appearance was to promote that event. When I go in early, I get off early. Jilda taught an early morning yoga class to the staff where she works and afterward had a dental appointment. She was home when I rolled into the driveway. Grabbing a glass of water, we both sat in the Adirondack chairs on the back deck and watched the clouds. We were short on words but with skies the color of aquamarine and with a gentle breeze out of the west, we didn't need many words. Just being there felt right. We noticed a Kaleidoscope of butterflies swarming the lantana bush. We'd transplanted the bush in early summer. I fretted that it was too late to move it. But the bush had not room to grow. We moved it to the back fence where it had plenty of space and sunlight for most of the day. 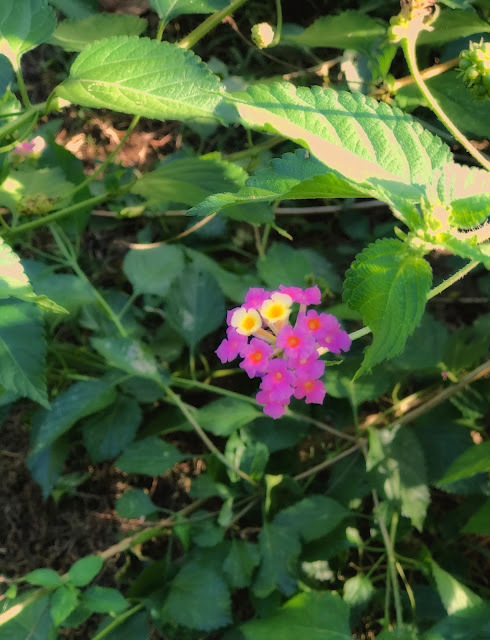 Like most fretting, my lantana anxiety was for naught. The plant is now twice the size it was before the move. Before the sun took its final bow for the day I stepped down for a closer look. Just so happens, I had my phone in my pocket and I snapped a picture. Did I mention that I love this plant? I am really glad that it not only adjusted after the move, but thrived. Lantana is classified as a noxious weed in several states here. But is beautiful. It will spread drastically if we let it. That's why we decided to move it from the flower bet. We cam contain it down by the fence. Be careful, they can take over!! You've got the perfect place for that plant and with the added beauty of the butterflies, it's a beautiful addition to your landscape. Glad you've cooled down some and can enjoy some porch sitting. Funny you should say, Lantana. Just left a friends house who pointed one out and said there is the cutting you brought me. I thought it was a weed around our house in Florida, but I trellised it anyway because the flower was pretty. When they visited he said he wanted a cutting and later I brought him one and forgot it. Sure is a pretty bloom. Those plants are so pretty! I have a purple Butterfly bush with a sweet fragrance that's fun to watch but I'm not sure of the name. It's full of butterflies and those humming bird moths. Sitting on the porch enjoying the weather and the view is the best way to relax. You make it sound so heavenly, just sitting there and taking in the fresh air and looking at the beauty around you. Who needs words while nature is doing the talking. Stay safe from the storms. I think some of the best moments in life are sitting and enjoying are own backyards! Pretty plant! It's a glorious little burst of color.